My wife and father-in-law got me this for my birthday this spring! 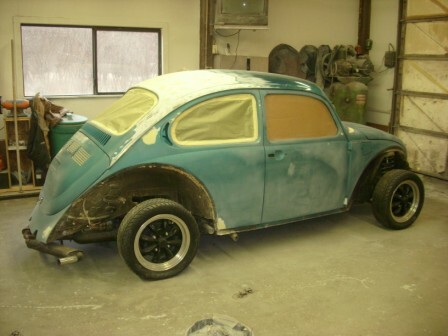 A family friend built this '73 super beetle back in 1991 and ran it around for a few years to some shows (it won a few trophies back then, I believe 1 at the bugfest in Yakima '93 or '94) and then parked it in a shed where it sat for the past 17 years rotting away! 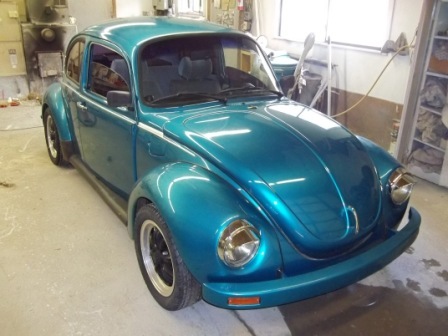 Once or twice a year I would see it in there and dream of owning another bug (my first car was a '67 beetle). We've spent the last year tearing it back down and rebuilding it. My father-in-law is an awesome painter and really made it shine! He originally painted it back in '91 the teal color and this go around we went with the Aquarius blue. I've been slowly putting her back together in my basement garage. Close to firing her up for the first time but still have a few issues to deal with. It has an 1835 motor with dual 40 webers. Hopefully it will be road worthy next spring and I can put some miles on her! Still looks pretty good after 17 years in a shed and a bath. But it had some cancer to be dealt with. prepping for a new lease on life! Thanks, I've been watching you and your son's project, very cool! You guys have really done a great job so far! True labor of love! I'm very anxious to see and hear mine run when I get it to that point! 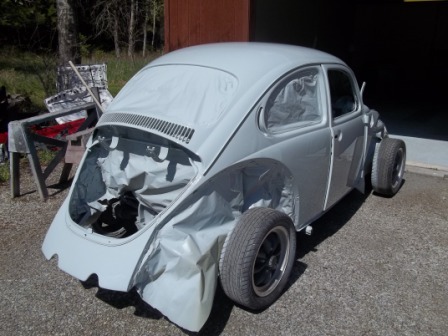 What motor set up are you guys going with in your bug? We plan on a 78 mm stroke 92 mm bore (2074 cc) with MegaSquirt fuel injection.